Town striker Charlie Walker is a doubt for Saturday’s trip to Morecambe after picking up a knock in training today. The 24-year-old was handed his first start for the club in the FA Cup second round tie at Bury last weekend, where he picked up a concussion. Fellow summer signing Ross Lafayatte will travel with the squad after returning from his hernia operation as boss John Still said: “He (Walker) got injured today in training. We don’t know how bad that is it, but he got through the other bit okay. “It’s a knock, whatever it is, it’s nothing terrible. “That’s why we’ll take Ross with us as he got quite a bit of the development game in midweek. 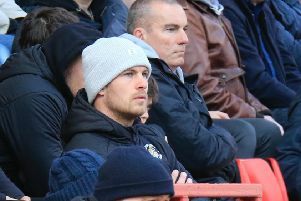 Winger Shaun Whalley is available, but Pelly Ruddock Mpanzu will miss out once more as Still gave an update on the other injury problems at Kenilworth Road. He added: “He’s (Whalley) all right, he’ll be available to play Saturday, he’s okay. “Alex Lawless is recovering and will be a few more weeks, while Paul Benson is coming on. That’s about six weeks from when he did it (broken leg) and we’ve had two weeks of it already. “So we’re looking for early January, that’s not too terrible. Lawless probably about the same, Pelly probably quicker than that, a week or two. “Curtley Williams is going to have to have his pin put in his shoulder, but we’ve got Michael (Harriman) and Paul Connolly is back in training.